I finally did it, I recreated one of the best kale salads that I have ever tasted. And what is even better, it is even more delicious than I remember it. First time I had a proper massaged kale salad was at the Good Life Eatery in London. When my plate arrived I was at first almost frightened by the huge load of kale. I was used to adding it to my salads and smoothies but not as the main ingredient. What surprised me was that the salad still tasted like kale, duuh, but without the bitterness. This is how I figured out that you have to massage it to remove the bitterness and bring out the sweetness. While traveling over the past few months I haven't been able to buy or prepare any kale. But the idea of making something similar to the above mentioned (and pictured) salad have still lingered at the back of my head. Now when we're finally here in San Francisco there is, no surprise, an overload of kale in every store. And I have a proper kitchen. And I had my first blog reader request for a recipe featuring sweet potato and kale. Well, I had to get down to business. Preheat the oven to 180°C/360°F. Peel and chop the sweet potatoes into small chunks. Place on a baking tray, sprinkle with cinnamon and use your hands to toss the chunks in coconut oil until evenly covered. Be generous on the oil. Spread the chunks in a single layer. Place in the oven and roast for about 40 minutes until tender. Grab the bottom of each kale stalk and pull upwards with the other hand. The whole leaf will come right off. Wash all the leaves in a big bowl. This is a trick that I learnt from the chefs at my previous job. Any dirt will sink to the bottom, and you can simply remove the top leaves after a few minutes. 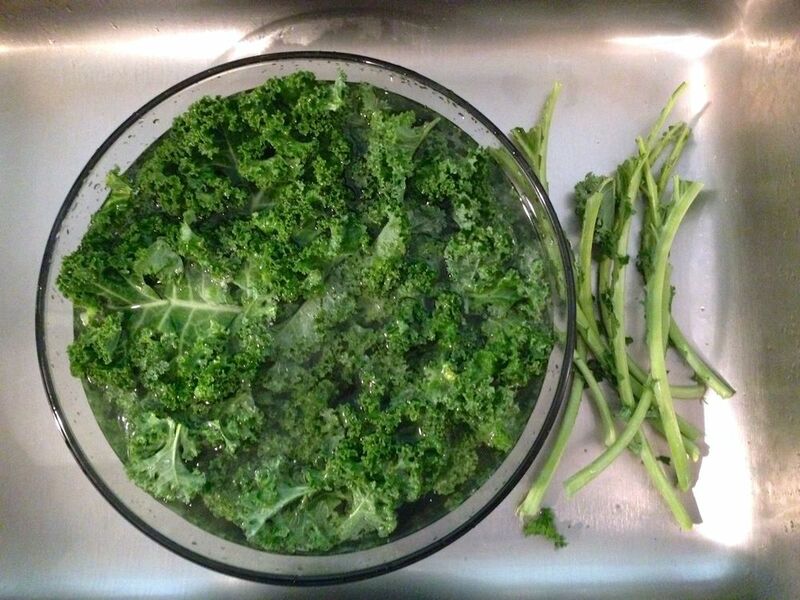 Squeeze out the excess water in the kale leaves before placing them in a bowl. Pour over some olive oil, lemon and salt and start to massage the greens for about 3-5 minutes. Bring water to boil in a pan and add the quinoa. Simmer for 12-15 minutes. Meanwhile prepare the dressing. Mince the garlic clove. Mash the avocado in the bowl and add garlic and teriyaki sauce. Try to find one with natural ingredients. If you cannot find one, substitute with a mix of tamari sauce, honey, ginger, vinegar and sesame oil. Taste check. Pour the dressing over the kale leaves and mix carefully with a spoon. Drain the quinoa and fluff with a fork. Remove the sweet potatoes from the oven when golden and crisp. Let cool. 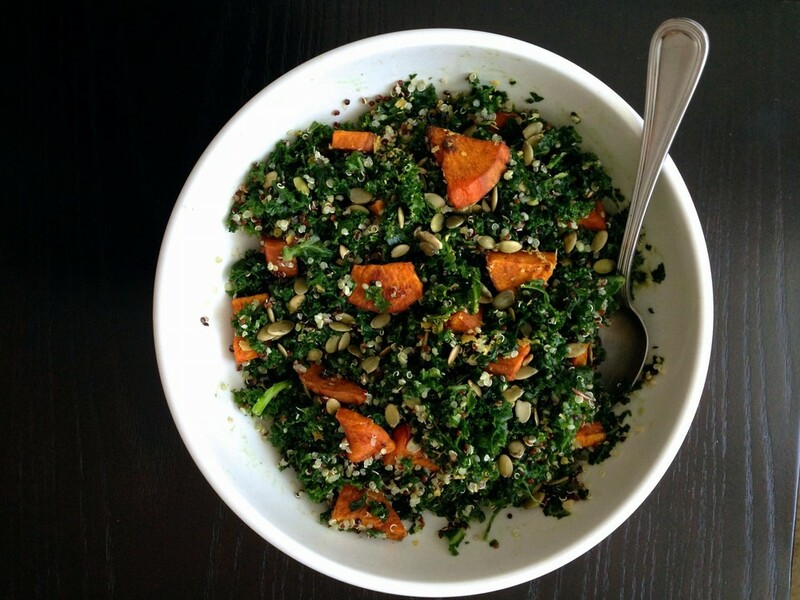 Add the quinoa, sweet potatoes, nutritional yeast, hemp seeds and pumpkin seeds to the bowl. Carefully mix together. Ready to serve! I also add some vinegar to the water to remove potential dirt or pesticide residues. Create a salad with decorative toppings, or mix it all around! .. and since food is better enjoyed in good company - please let me know if you happen to turn around any kale critics with this recipe! That would be amazing!